It was the brainchild of Lee Lofland--probably born out of frustration over writers getting it wrong--but it’s turned into Club Med for authors wanting to get it right. Writers’ Police Academy is a growing annual event bringing mystery writers (and a few other genres) together with experts in the field to discuss--and sometimes experience--just how it is that the police and related law enforcement agencies work. But the jail tour was interesting. “Hey, there’s some kind of tour group coming through--and a bunch of women. I ain’t seen a woman in two years.” We were able to see everything from the area where prisoners are brought in, to the medical area, to the control room, where cameras scanned the entire facility. But the next morning, buses lined up to take us to the community college http://www.gtcc.edu/ where our classes were held. Not your typical writers conference classes. While demonstrations by various law enforcement agencies took place in the parking lot, I took my first class called Making a Lasting Impression--and it was NOT about pitching a manuscript. It was about evidence collection, especially in the form of tracks. Take-aways? I learned that police typically collect and process only about 18% of all evidence at a crime scene. Why that number is so low is shocking in some regards, but on the other hand, I was kind of excited, since it leaves another 82% of evidence for my eagle-eyed amateur sleuth to find. And I can’t wait to get home and shine a flashlight at an oblique angle (about 10%) on my living room floor. (Try it.) The class also inspired an idea for the next book, but I’m not giving any of that away! The next class I went to was called Chiefs and Sheriffs, and basically detailed the difference between the county sheriffs and local police (with the add-on of a little about state police and other agencies). Which doesn’t sounds all that interesting, but it was. Some of the nitty-gritty details are hard to come upon online--such as sheriffs are elected, and therefore more unlikely to want to irk voters by arresting them, at least for minor infractions--I suspect might work their way into my next book that I think is going to take place just outside the boundary (and jurisdiction) of my fictional town. As a cozy writer, some of the classes offered are unlikely to turn up in my writing. For example, mass shooters, human trafficking, and street prostitution. But nice to know they’re there for those who need them… And I’m hoping that someone I met at the conference will chime in and tell us a little more about her experience in the Underwater Evidence Recovery class. She was excited about being chosen to go into the water. Kathy Reichs is a hoot. A mystery reading group I attend has gone to lengths debating the merits and pitfalls of her books vs the TV show. (I happen to like both, although I will say I find them different in tone.) I wondered which one she would appear like in real life--light and humorous like the show, or darker and more serious like the books. The answer is both. Although I’ll win an argument with one of my group members: there is no way she is suffering because some insensitive producer changed her characters. No, on the contrary, from how she went back and forth discussing the books and the show, I think she is having a ball doing both. Lisa Gardner spent a bit of the keynote discussing how her career developed--encouraging other writers on the journey. No, staring at a blank screen doesn't get any easier. But she was all in favor of brownies. Very inspirational. I’m all charged up. And completely exhausted and wondering just how you can be both. My favorite thing about the Writers Police Academy? The firearms training. Okay, sure the hostage died while I was taking out the bad guy. But I did get the bad guy in the end. :) And I enjoyed—way too much—kicking in the door on a building search. So many wonderful classes—not enough time to take them all. I'm ready to go back next year. How about you? I'm definitely going back--whether it's next year remains to be seen. So much to learn it's impossible to take it in all at once. WPA was amazing. My favorite part was the ride-along. We responded to calls for everything from a drug overdose to a kid who accidentally dialed 911 to a followup on a child prostitution case to a domestic assault resulting in arrest...and never once did I have to stay in the car. I have an embarrassing problem with law enforcement: they are my rock stars and superheroes, and when I'm near a police officer, I'm like a pre-teen at a Justin Bieber concert - my brain goes dark, and I can hardly form sentences. So I did a lot of stuttering over the course of the weekend. Sadly, my ride-along did nothing to change this perception. The officer who put up with me was everything I thought she'd be. I'm still in awe of the risks these people take and the things they do for us every day. Nancy, sounds like you had a fantastic time! I wouldn't be embarrassed at all. And what better day to celebrate the heroic work of first responders. 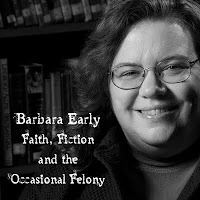 Barb, I'm having lunch with Christy Barritt today. Have a feeling I'll get to hear about some of this in person. That sounds like all kinds of fun, Barb! So tell me, what am I supposed to see when I shine the flashlight on my living room floor at an oblique angle? Does it make the dust bunnies come to life? Well, if the light is intense enough(and the rest of the room dark) and someone was recently walking on the floor, you can see some pretty clear tracks in a layer of dust you might not have known you have. Me, I know I have dust. As always, it was great to see you again, and I'm pleased that you had a good time at the WPA. Sure, the WPA is an intense, action-packed learning experience that involves, guns, explosions, and handcuffs. But where else can writers go to play cops and robbers with people such as Lee Child, Lisa Gardner, Kathy Reichs, Marcia Clark, and Jefferey Deaver? Thanks for writing this up, Barb. I've done 2 (different) local Citizen Police Academies (at two different points in my life when I was trying to write contemporary suspense). This one has always sounded like so much fun, but I just don't see how I could make it pertain to mysteries set in early 19th century England. Anyone know of an historical writers police academy??? I had a great time! It was nice meeting you, Barbara. It's hard for me to choose a favorite, but if I had to I'd say it was the forensic workshops. My books have a forensic element, so I was absorbing all the information in those classes! I definitely want to go back again next year! CJ,some of it could. The classes taught by Dr. Ramsland, the forensic psychologist would, since people don't change all that much. It might help develop a good villain. Some of the evidence gathering techniques might work. But a class on historical forensics could be interesting. Christy, it was a real pleasure to meet you, too. Yes, the forensics classes were fun--but my brain was turning the whole time trying to figure out how to adapt them for my amateur sleuth. A whole different ballgame. But yeah, one of my favorites was the presumptive blood stain testing--which I got to do next to Mindy Starns Clark. Wow, that sounds so interesting and so much fun! Great write-up, Barbara! Fun to relive the highlights. One of mine was to meet you, and that's not just sucking up. I learned that in these cases, the divers often can't see a thing in murky water. They work in tandem with a handler topside, who guides them with a rope to sweep search areas in arcs. When we found the (no longer smoking) gun, we secured it in a cylindrical evidence bin, fastened it to a parachute-like attachment, which we inflated to send shooting up to the surface to the rest of our team. Then we did it again with our masks taped over! I definitely had a blast, and got some great plot ideas. Thanks to Lee and every person who worked to make the WPA such a huge success. Can you use a 100-year event in your story?